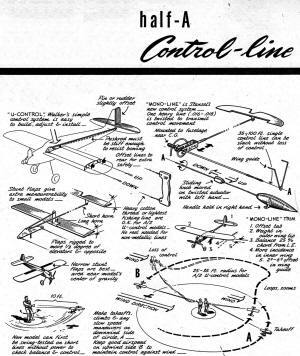 Half-A (aka 1/2A, 1/2-A, and A/2) control line flying has been a staple of the model airplane hobby for at least 3/4 of a century. 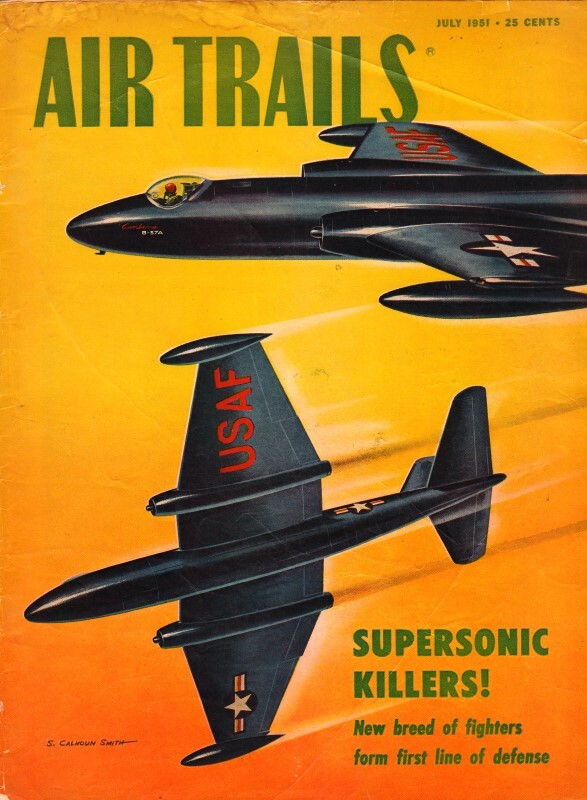 Because of the relative low cost and low complexity of the engine, airframe, and fuel consumption, 1/2-A has been the entry point for untold thousands of kids and adults - an 'entry drug' of sorts because many of those people, myself included, get 'hooked' and move on to bigger (but not necessarily better) things as the years and decades go by. The well-known Cox (L.M. Cox Manufacturing) ready-to-fly plastic models are no longer produced, but some of the .049 engine parts and even some full engines can still be purchased both on eBay and from the Canadian company, Cox International, who bought the remaining stock of Cox components a few years back. They are also selling collector-quality vintage engines still in the original packages. 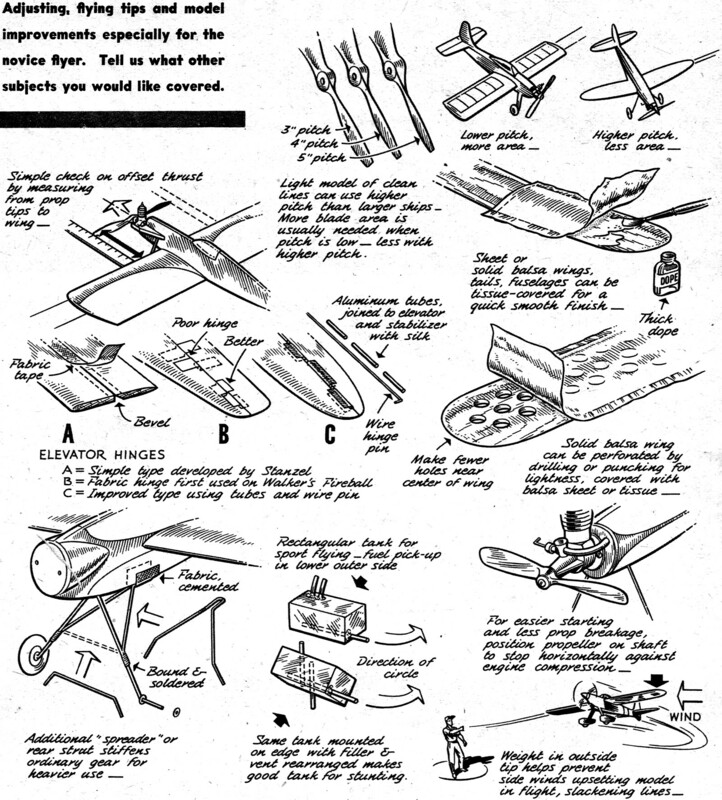 Anyway, this article from a 1951 edition of Air Trails provides a primer on 1/2-A modeling. Adjusting flying tips and model improvements especially for the novice flyer. Tell us what other subjects you would like covered. Though the intriguing Half-A control-line models are leaders in popularity, particularly among beginners in modeling, they are not without their shortcomings. With engine displacement reduced to a small fraction of the size we have been accustomed to in the past (a Half-A engine is only one-twelfth the displacement of a Class D .60 engine!) there is a corresponding reduction in power. The smaller, lighter ships that result are more at the mercy of the winds than the larger ones and have little of the very "solid" feel we associate with larger, more powerful control jobs. An inexperienced modeler with a new Half-A control ship is wise to wait for calm weather. Follow the wind diagram carefully for proper operation. Jim Walker's "U-Control" and the new Stanzel "Mono-Line" are the control systems in use nowadays. U-Control, with its inherent simplicity, is foolproof; it utilizes two tether lines to handle, movements of which are transmitted to a pivoted bellcrank, thence to hinged elevator. 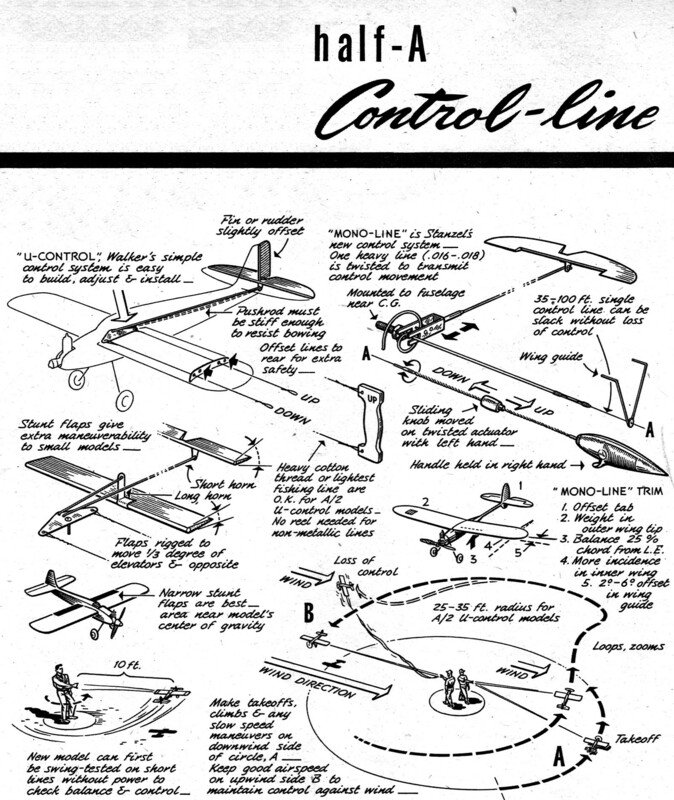 The lines must be kept taut, however, and such methods as outward offset engine thrust line, outward offset rudder tab, weight in outer wing tip, more incidence in inner wing panel, and rearward location of control line wing guides are resorted to in various combinations to maintain line tension. 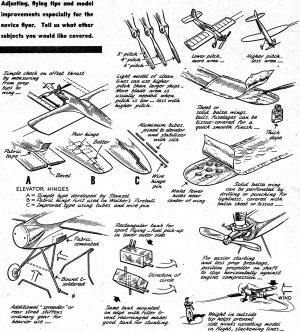 These many "tools" can be used to extreme, causing a crabbing flight attitude which is neither efficient nor desirable. An untested model should incorporate perhaps two of these wrinkles for a safe test flight; reduce them as much as the flight attitude indicates you can get by with. Half-A models can be flown on very lightest casting line or heavy commercial cotton thread. Only the lightest wire lines need be used. Heavy threads can be wrapped around the handle, while metal lines require use of a reel to prevent kinking or curling. Mono-Line flying presents two outstanding advantages: longer lines can be used-up to 100 ft. radius - and full control is maintained even if the line should become slack. When short lines are used, .016" dia. steel wire is specified, and when length is increased to 100 ft., the diameter is increased to .018". Smaller or larger sizes of wire affect control; don't use stranded or braided "cables." It is best to balance U-Control models fairly nose-heavy, somewhere near the wing leading edge. Mono-Line ships should balance about 25% of chord from leading edge. Selection of woods, type and extent of paint job, wheels, propellers, etc. affect balance greatly. Improper balance of a finished model can often be corrected with lead weights.